You perhaps have noticed that I've not named any barbecue beers or ales. This is not an oversight. I've just not found one worth a special mention. This is likely due to living in the land of Bud, Busch, and Miller Light. Yeah. We can get a Corona, but that's about the extent of it. North Carolina is a micro brew state, but you have to be in the right area to check those out. Then, it's so hit and miss. Bummer when you pay $5 for a beer that is hard to even swallow. I visited Whole Foods store in Chapel Hill and got a random six pack of beers. Just select any six and pay something like $9.99. Beats the heck out of going to a restaurant and paying way more for a stinker of a beer. Better to check them out ahead and know what you might be able to handle. By far the best in our sample pack of beer was Seven Sisters Abbey Style Ale which I split with my son. He drew a gross one (some Turtle beer), so I figured I'd share my luck of the draw. We both found Seven Sisters to be really good. 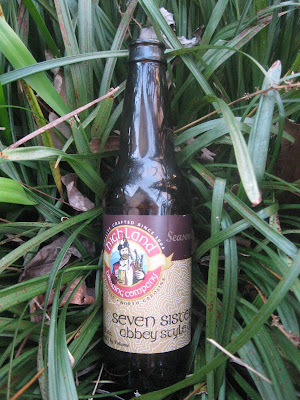 Seven Sisters goes well with barbecue. It's mild enough not to overpower the pork, and it just has a smooth mellow flavor. You don't get a head rush like you're burning out some brain cells with this ale. I could go on and on about what's in this beer and how it's brewed. Frankly, this is like candy. I really do not need to know the details. I know what I like. I like what I like. Do feel free to visit Highland Brewing if you'll feel better knowing all the details. I'm just not that into the details though did read the materials. Seven Sisters was released as a seasonal ale, but I see it is clearly on the market. Of else Whole Foods dusted off some really old bottles which I frankly doubt. I'd guess other folks liked Seven Sisters as well, and I do hope they keep it on the shelves. Least you think that I know nothing at all about spirits, rest assured that I did have premium beers when I lived in Greece and Japan. I've been hard pressed to find any beer made and bottled in the United States that do much for me. Yes. I did get spoiled with real top quality spirits. I do, however, consider Seven Sisters an ale that has a great flavor but not so strong as to make all the guests forget about the barbecue or grilled foods. Beer should compliment - not distract. Seven Sisters does just that. I've seen the Seven Sisters beer in stores but never have really thought to try it. I may just have to do that now. By the way, if you like darker beers, give the Highland Mocha Stout a try. Hi Wayne - Yes. You've got to give it a try. It's mild. I think the alcohol content was 6 plus. The bottle is dark, but I suspect that was a light colored ale. Should have poured a glass, but then more dishes to wash. Lazy me. Haha.